nelmnef(itettyp(it)) gives the number of facets of element it. ielmface0(iface,itettyp(it)) gives the number of nodes on facet iface of element it. ielmface1(local_node,iface,itettyp(it)) gives the increment to the node number (local_node) on facet iface of element it. 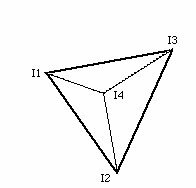 nelmnee(itettyp(it)) gives the number of edges of element it. ielmface2(inode,iface,itettyp(it)) gives the edge number associated with inode on facet iface of element it. jtetjtet(jtetoff(it)+j) gives the element number and local facet number of the neighbor to element it, facet j.